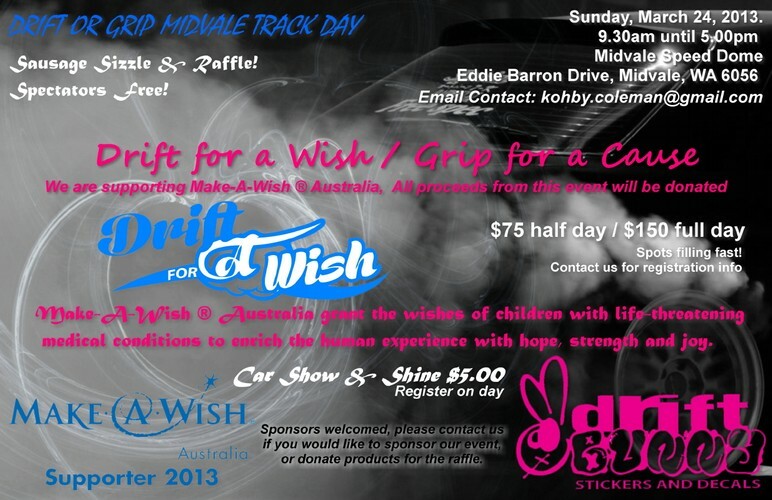 Drift For A Wish are supporting Make-A-Wish Australia. Come and check out this Automotive Track day at the Mid Vale Speed Dome. Watch drivers participate in the track day driving their cars around the race track in a japanese style called drifting, or just taking their cars out there around the track for fun and in support of Make-A-Wish Australia. This event will also feature a Car Show n Shine, Raffle and Sausage Sizzle. All proceeds from the day will be donated to the Make-A-Wish Australia Foundation. If you would like to enter your car in the Show N Shine, roll up and register on the day. All proceeds go to Make A Wish. Prizes will be awarded for the Show N Shine.